We will discuss here about measuring an angle with the help of a protractor. You can find it in your Geometry Box. It has the semi-circular shape. Its semi-circular edge is divided into 180 divisions. Each division represents a degree denoted by °. 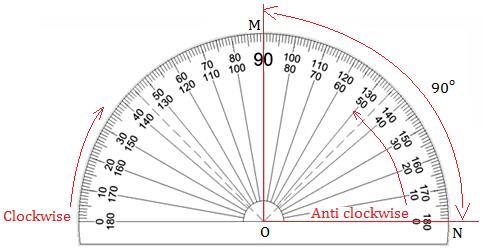 There are two scales marked on the protractor – outer and inner. The outer scale is marked from 0° to 180° in clockwise direction. To measure the given ∠MON, we place the protractor in such way that its centre is on the vertex O of ∠MON and its straight horizontal edge lies on the arm ON of the ∠MON as shown in figure. Now we see which degree mark on the scale of the protractor, the arm OM coincides with. In the given figure, OM coincides with 90°. So, the ∠MON measures 90°.